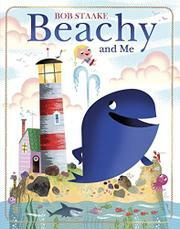 In rhyming text, the diminutive, blonde, pink-faced Pixie Picklespeare befriends a whale named Beachy. The book begins with a colorful, gently humorous, double-page map of tiny Pixie’s Island “and surrounding ocean environs.” The layout and the retro art are reminiscent of the board game Candyland—especially at Great Candy Cane Coral Reef. The charm ends there. Pages of garish cartoons and vacuous verse tell the tale of Pixie’s boredom, all alone inside her lighthouse, until a loud burp leads her outside. The blue creature who has been beached on her island says, “Oh dear, this must look rather odd— / quite anything but peachy. / Apparently, I’ve washed ashore. / Hello—my name is Beachy!” There follows a simultaneous succession of 10 similar images of Pixie trying to push the behemoth back into the sea, which does not work. The tide conveniently rescues Beachy, who promises to be Pixie’s “ocean playtime guide.” The two cavort through the ocean during the summer, becoming “a wet ’n’ wild odd couple!” (Exclamation points are intrusively frequent.) Then Beachy admits the hard news to Pixie that he must migrate to be with other whales. Pixie is back to moping inside her lighthouse. Will he return next summer? A few more pages of singsong rhymes and less-than-inspired art lead to the expected conclusion.